Your home, your vehicle, your business, All these things aren't just important to you, they're essential to your everyday livelihood. Don’t trust the safety and security of yourself, your family or your business to just any kind of lock, or technician to service it. 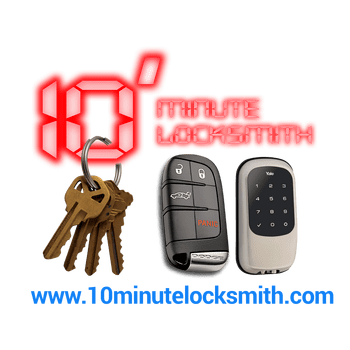 Instead, if you're in the area of Tampa, Florida and want to make sure your locks are installed, serviced, or replaced with the utmost care there is simply no better company to call than us here at 10 Minute Locksmith. Our hard-working technicians have the knowledge, skill and know-how to make sure that no matter where you are your locks and keys are always working to the best of their ability. Your vehicle is your lifeline to the world, it’s what allows you and your family to get from your home to wherever you need to go, and back, as quickly and easily as possible. With a wide variety of possible lock or key issues that may pop-up in regards to your vehicle, With a quick and simple call one of our technicians will immediately head to your location to get your problem solved and your car back out on the road right away. 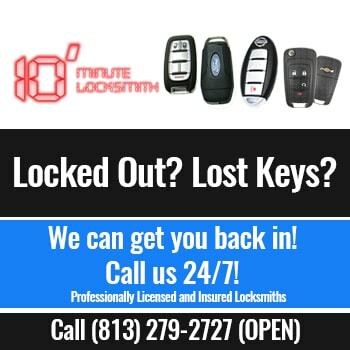 Whether you've been locked out of your vehicle, need your ignition repaired, or outer locks re-keyed, transponder keys, or even key fobs re-programmed for use you can rest assured that the highly knowledgeable technician that responds to your call can easily take care of any lock or key issue with any vehicle you own. Providing Full Residential Locks Services, Keys Making And More! When it comes to your home there is a slew of possible lock and key related issues that could arise over time, So instead of waiting for the problem to occur and trying to solve it once it does, it's best to be proactive and have a high-quality company ready to work for you any time you need it. Offering an incredible variety of different residential lock and key services from getting you back inside when you've accidentally locked yourself out to re-keying or installing and replacing locks in a recently purchased home, Our talented technicians are more than capable of taking care of whatever you may need. Your home should be your safe space and with our amazing technicians here for your 24 hours a day, 7 days a week you can rest assured it will be. As a business owner you know that keeping your workplace secure when you can't be there is an absolute must, You can't spend all your hours away from work worrying about whether everything is safe and locked up tight at the office. Take the worry out of your workplace security when you call us to install, repair, replace or re-key any lock, anywhere your business requires. It doesn't matter whether you own a small business, a large business or an industrial site, Trust our incredibly hard-working, qualified, professional technicians for all your company's security needs, big or small, no matter how basic or technological the lock may be. 24/7 Emergency And Fast Response Guaranteed! Please visit our other franchises under the same ownership: Tampa, Clearwater, Brandon, St. Petersburg, Orlando. I was helped by Oby and Miranda on my very difficult car door. It took both of them to open my car. They were very respectful and patient with my car, as well as the difficult situation. I am very pleased with their service! When I called everything ran smoothly and was told that the tech should arrive in the next 15 mins. The tech called me and was confused on how to follow the address I provided to her. I gave her the address 3 times and still is having a hard time. I even suggested maybe putting the address of the ymca that is right in front of the apartments I live at. But that also didn’t seem to work. A hour has gone by I call the company and I told them I was told that someone was going to be here in 15mins. The guy on the phone was very rude and told me that no he didn’t say that. I told him I didn’t speak to him I was promised by another employee. Turns out lady gets here and to blame is the new guy who wrote my address down wrong but that is still not an excuse because I gave the lady my address 3 times. The tech was very nice and apologetic but the people working the phones and write down the address need to get it together. One messed up and it ruined it for the rest. Don’t waste people time . 10 minutes on the mark! This guy was lightning fast ! and will also come to you.I got a new fob key that needed to be cut and synced to my car and the guy took 10 mins! Literally. Very happy. Reasonable and friendly. We have used this company for several lock issues. They are very good and friendly. Every time I tried to drive my car, for weeks I almost couldn't get the key to turn in the ignition for some seriously unknown reason. Finally, the morning I was in the biggest hurry of my entire week, I tried putting the key in the ignition, and no matter what I did the key absolutely refused to turn. Thankfully I had decided to leave my house early to get lunch before work so I had time to get the issue worked out. I've used 10 Minute Locksmith in the past to get me back into my locked car, and I remembered this is a service they offer, and they're fast, so of course I called them immediately. The technician was out to my car in just minutes and I was on the road to work with 15 minutes to spare, so happy with their service yet again. Somehow my car key managed to break off in the car door, and since I had to be to work in a few hours, I needed help and I needed it right then, My next door neighbor saw me outside my car totally freaking out, and recommended that I call 10 Minute Locksmith because he could probably have me back in my car and on the way to work in time. I was absolutely amazed when he showed up within the hour, and had my car fixed up not long after, I actually ended up getting to work just a few minutes late, and no one even realized that I had had a problem. I honestly couldn't believe it, and would recommend him to anyone who has a problem with a lock. The year somehow got away from me, and I ended up having to do all my Christmas shopping in one day, just a few days before Christmas. When I came out of the first of ten stores I needed to go to, and realized that I had locked the only set of keys I have in my car, I really started to panic. I called my Mom to see who she recommended, and she said to call 10 Minute Locksmith right away. I did, and was so incredibly amazed at how fast he came out and got me back into my car and on with my day! I just barely had enough time to get all my shopping done, and I would've been totally screwed if I hadn't called them. I would recommend them to anyone with the same problem. Sam is great! he came out right away, he was able to get into my apartment easily, And made me new keys, he's knowledgeable and friendly.